I spent about an hour and a half at Montrose this morning, December 21. It certainly looked and felt like winter, with a thin layer of ice on Lake Michigan all the way to the horizon. As expected for this time of year, diversity was low. I ended up with 25 species, highlighted by a nice adult male Northern Harrier, the continuing female Rusty Blackbird, and hundreds of Common Mergansers. When I think of an emblematic Lake Michigan winter bird, I think of the Common Merganser, a hardy duck that can survive our brutal winters with just a little open water to find fish to eat. Link to my eBird checklist below. This entry was posted in Winter Bird Reports and tagged Icterids, Rusty Blackbird on December 21, 2016 by rhughes. 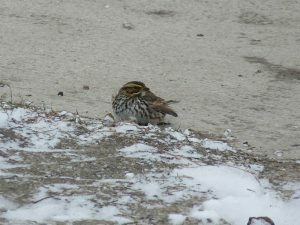 I took advantage of the break in the snowstorm to get some birding in this morning, December 11. 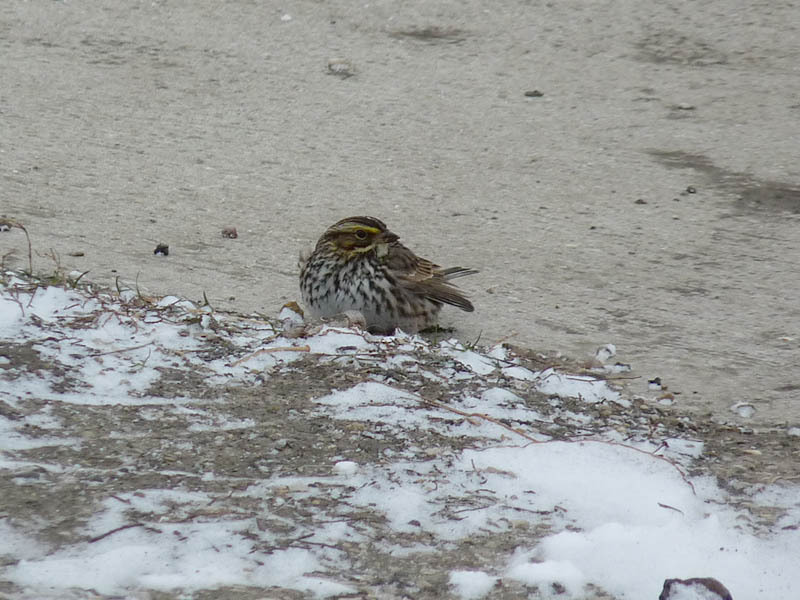 I don’t expect to see much at this time of the year, but I did have a few surprises, highlighted by a late Savannah Sparrow near the mouth of the harbor. 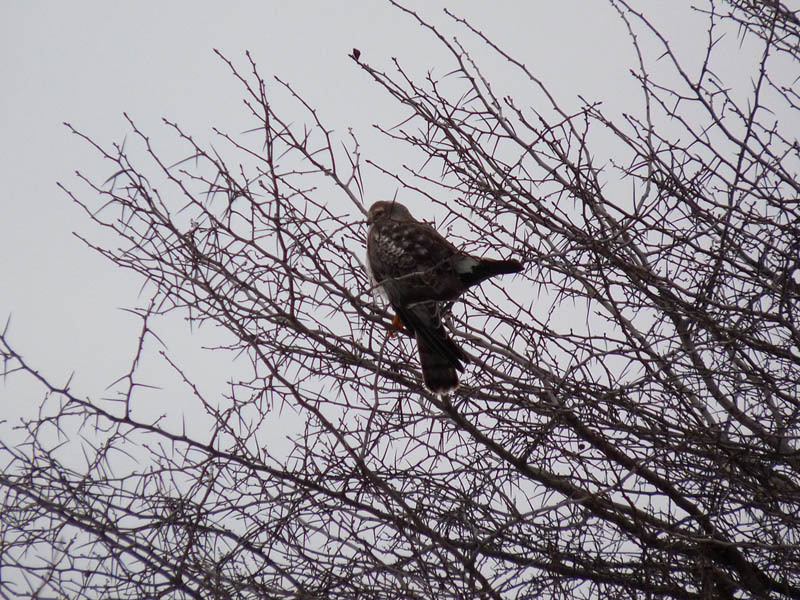 I also had an immature Northern Harrier in the Dunes, 15 Redheads, 2 American Pipits that probably wish they had flown south, and a Rusty Blackbird. Several American Pipits have been holding on in the native planting area for a few weeks. Link to my eBird checklist below. 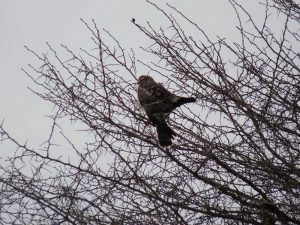 This entry was posted in Winter Bird Reports and tagged Hawks, Icterids, Northern Harrier, Pipits, Rusty Blackbird on December 11, 2016 by rhughes. 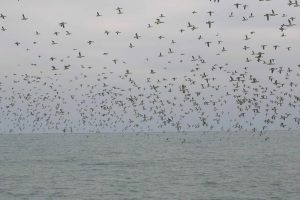 Red-breasted Mergansers have arrived in force on the southern end of Lake Michigan. 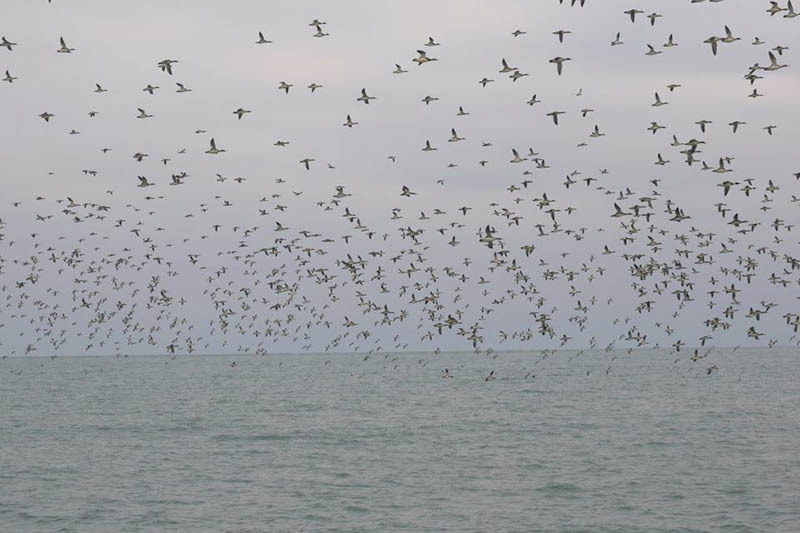 Hundreds to thousands of these fish eating ducks have been at Montrose and other Illinois lakefront locations the last few days. Red-breasted Mergansers are one of three common wintering ducks on Lake Michigan, the other two being Common Merganser and Common Goldeneye. Luiz Munoz photographed this swarm of Red-breasted Mergs at Montrose on December 3, 2016. This entry was posted in Winter Bird Reports on December 4, 2016 by rhughes.